Hey, what’s going on everyone? This is Chris from StrategyBeam, and today we’re going to look at content silos for the website and how they work with SEO Marketing. This topic is a little bit more of an advanced SEO marketing tactic, but it’s something to think about if you want to market your small business or startup should know if you want to see immediate results in rankings and sales. Let’s jump into this topic now we can look at what content silos are, and the benefits of content silos. A few of the main factors that are impacted by content silos on your website include adding value to your site, a boost in rankings and drive conversions. All of these factors will help improve your bottom line and should help make towards your business goals. I like to think of Google as a smart three-year-old. It’ll do what you tell it to do, but you need to understand it precisely what to do. As business owners and marketers, it’s our job to align the needs of our customers with content in a way that Google can easily understand. Site structure is one of the ways to make this impact you are looking for, and these are the benefits of content silos. One immediate benefit you will see from content silos for your SEO marketing strategy is that these will improve your ranking power. 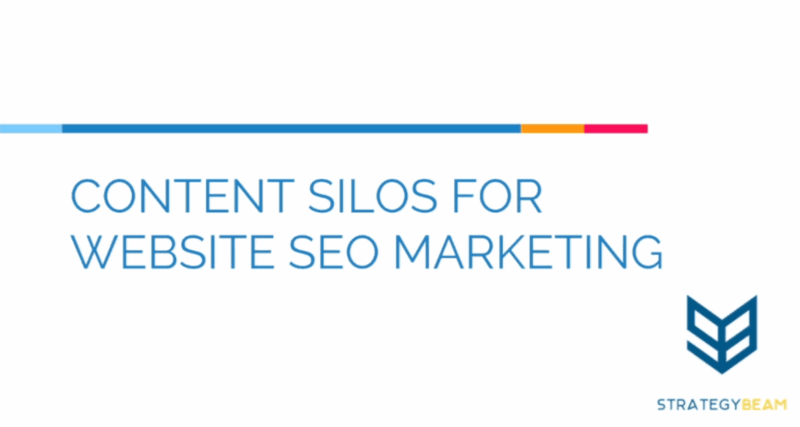 As you build out your SEO marketing content silos, you’re going to be organizing content in particular ways. This organized structure means that all your content is similar to content within that content silo. This is going to help with your ranking power based on their relevancy and based on their importance to your business. As you start grouping content, your content is going to become more usable, easier to understand, and your customers are going to be able to search your content quickly. URL hierarchy is another benefit that content silos add to your content silo. We’re going to look at a few examples of URL hierarchies and don’t worry about if you don’t understand that term right now. We will go over some concrete examples and go over ways to understand this concept! Your site will see immediate results in ranking and conversions because URL hierarchy structure will improve your site’s SEO structure and power, while also enhancing the user experience of your consumers on your site. Let’s first look at what content silos are by looking at two examples. One is a site that does not have a content silo and another place that does have a content silo. Let’s look at the differences, so we can see what it is and what it is not. The above diagram is an example of a website that does not have content silos. As you can see, there’s a parent page. If you were to put that as camping, you’d have a child, one such as backpacking, he’d have a child to such as camping tents, and then you might have my blog posts or even me other non-related child pages. Here’s an example of a website structure similar to the previous one we just looked at, but this example has a siloed structure. Here you can see a siloed content because this website architecture highlights an active page and content silo. You can see this architecture with a parent page, and then directly under that file path, you have child one child to child three. Right under the child page two, you have article one, two, and three. You can see that this is highly organized, and highly categorized content and Google bots, as well as consumers, love to see this kind of content. We’ll go into some exact examples of this it’s not as abstract as parent-child, but it’s important to understand these terms and what these terms mean. One of the benefits that we looked at where that silo content makes hierarchy URL structures, and this improves SEO and user experience features. How Do Content Silos Improve SEO & UX? To help us understand how content silos improve SEO marketing and UX, we will take a camping website as an example. Our camping website has a lot of outdoor camping gear, fishing, hunting, all these other outdoor products. Let’s think of website.com/camping. If you have underneath camping, you could have some other categories such as hiking boots, tents, backpacks. Obviously, we don’t want to organize our hiking boots in the same category that we have, our tents or our backpacks because those items have specific uses and people searching for a camping backpack are not necessarily looking for camping, hiking boots. Choosing how to organize your website should be based on the needs of your customers. To make your content easier to search for and use for your customers, you don’t want to combine content from different categories in a single content silo. If you make this mistake, it will be hard for the user to find the products or services that they need. Then we’re looking at how to make that more specific with tents, and then within the general Parent Tents page, we have different categories or child pages for each one of those, and this is very important just to understand because as we begin to build our content we always what to make our website’s a sales machine for our business. Now that we understand that content needs to be organized to help your SEO marketing strategy improve, lets look at some reasons and examples that benefit from organized content on your website. We want to make sure that all of our content is easy to consume for both customers and Google bots. What questions can you ask as you begin to organize your content silos? Here are four ways and issues you should always have in the back of your head as you build out content silos. What subject themes or ranking as in going into Google Analytics or doing online research? We’ve done a couple of other videos that I’ll link in the description about how to find this information online with competitive analysis, but seeing what themes are ranking within each other. What subject theme themes are relevant to your business. We looked at that camping gear example, and we saw hiking boots, tents, backpacks. Think of those more significant categories of how you could break down the big bucket such as camping and then breaking it into smaller components and then breaking it down from there. Look at how you can divide subject themes. I recommend that you don’t separate your categories any more groups than three to five sub-subject topics because anything more than that means your buckets are probably too broad, to begin with. If you get deeper than three or four or five or whatever subject themes, try to break those out a higher level up. Google bots (and your audience) only want to dig so far to find the information they need, so by keeping your website architecture to only 3-5 levels of child pages you will help your technical SEO and user experience. You need to optimize your website to be found and searched by humans and robots and structuring your website with content silos will help customers to engage with your website and make sales, that’s all fine and dandy, but let’s look at how to build and optimize your SEO content silos. These are actionable tips that you could take today as you start to plan out your content silos to rank better, get more qualified traffic and make more sales. Since the topic of content silos are an advanced and abstract topic, I want to include as many visual references for you to learn from. I’m a visual learner, so I want to make sure that I’m giving that visualization to help you understand this because this is pretty advanced, to build and optimize. The first one is you want to optimize content by distinct themes. 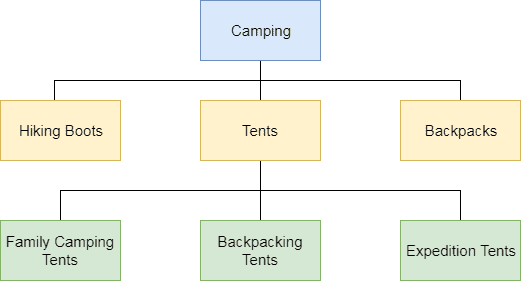 Here’s the example we have camping and then ideas, our hiking boots, tents, backpacks. Then within the tents category, we have the family camping tents, backpacking, expedition, etc. You will have this same type of content organization for hiking boots, backpacks, whatever else you might have, but this is just an example for the tents. You don’t want to have backpacks containing backpacking tents, because even though it is for backpacking, you are trying to sell tents in this specific category organization. To help with this process, you can start with your product and work backward as you start thinking about how to set up your SEO content hierarchies. You always want to combine pages that are similar together since similar pages will rank the best together. In this example we have camping and then parent pages in a horizontal collection. Our hiking boots, tents and backpacks, and then you can expand that out as far as you want. Then the child pages for tents are the backpacking tents, family camping tents, expedition tents, and then each page will have their own unique keyword sets. I like to stay with three main keywords into LSI keywords, give or take for every 1,200 words that I write for content pages in each silo on my website architecture and marketing strategy. Our parent page for tents will be distinct from backpacking tents page in the other content silo. You can learn more about proven keyword research strategies to ensure that your content is relevant and valuable for your audience. We went over these topics in other videos about how to do the keyword research and how to optimize content. We also looked at the exact steps that you can use to research, create, publish, and optimize content based on SEO marketing content silos for your website are making sure that the content flow is organized for maximum effect. 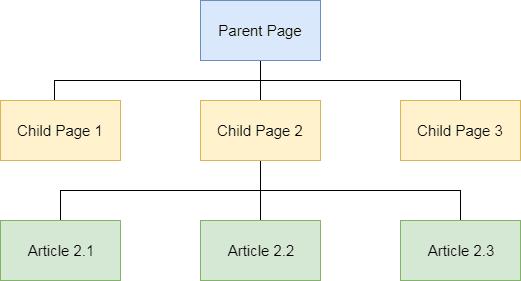 Parent pages should only link to child pages within that same silo. As you see here, tents will just link to any of their child pages you could link from one tent type to another like family tents, but this only occurs within a single content silo. 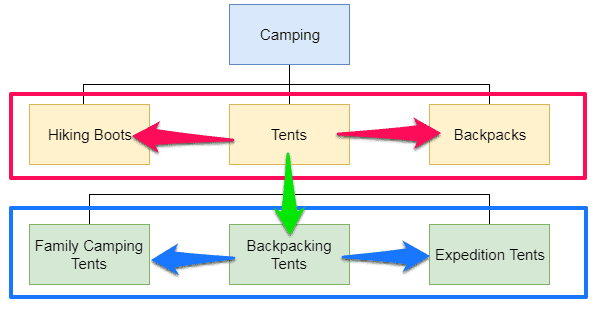 Camping tents can link to the expedition tents page. 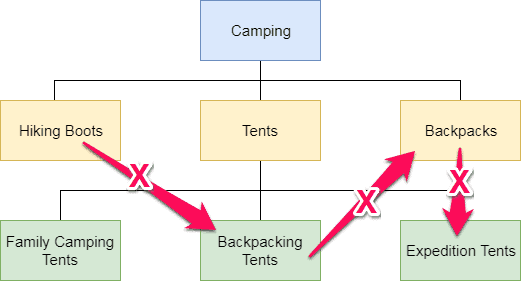 However, you should never connect from backpacks to backpacking tents since packs is a parent page for another silo. Tents for example and the child pages should only link to child pages on that horizontal plane. It’s okay to have backpacking tents link to expedition tents, and you can also have backpacking tents relate to family camping tents, but you never want to have it going to any other silos. Parent pages should only be linked to other parent pages because as you go deeper into each content silo with these keywords, you want to make sure that you’re just hitting based on those keywords within their respective SEO marketing content silo. There you have it guys, that’s pretty advanced SEO marketing strategies, but from my experience and the experience from my clients, SEO Silos and content silos can have a dramatic impact on your online rankings. Not only does this approach make your content more accessible to consume by Google bots, but it also makes your content more accessible for consumption by your customers and ultimately that’s the goal, making content that ranks and creating content that banks! Thanks a lot for your time. If you liked this video, please give us a like, comment and subscribe to our channel. I’d appreciate it if you shared this video with your friends because that helps us out a lot until we talk again on me other SEO marketing, SEO copywriting and online marketing tips. I look forward to speaking with you soon, thanks!